HTC has hinted photography is going to be a key part of its October 8 announcement in New York and speculation is rife we could be about to see a new handset. Along with a periscope-shaped camera, it's rumoured the Taiwanese company will be showing off a new handset named the HTC M8 Eye - note the loss of the 'One' moniker, although this is far from confirmed. 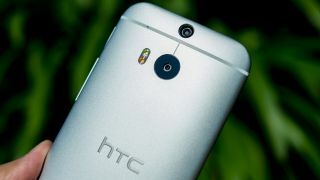 According to Android site Phandroid, the Eye will be a version of the HTC One M8 but with a 13MP Duo camera rather than the 4MP UltraPixel snapper in the current version. Quoting an Android developer posting on Twitter, the site pegs an October launch date for the new handset that will arrive running Android 4.4.4 and HTC's own Sense 6.0. HTC has already altered the One M8 once with the HTC One E8, dropping the metallic casing and the UltraPixel Duo camera for a plastic chassis and standard 13MP lens. A lot of the buzz around the One M8 came from its Duo camera sensor that allowed you to refocus and add effects post-shot because of the camera's depth-of-field ability. HTC is one of tech's most leak-prone companies, so we wouldn't be surprised if more details on the HTC M8 Eye emerge before October 8 is upon us.